Downbound at Quebec City, Oct. 13, 2004. She will not be seen on the Great Lakes as the hull is too wide for the locks of the St. Lawrence Seaway. Instead, the ship keeps busy on the St. Lawrence hauling ilmenite ore from Havre St. Pierre to Sorel for QIT-Fer et Titane. This vessel dates from 1966 and construction by Ishikawajima-Harima Heavy Industries at Tokyo, Japan, as their Hull 922. She entered service for the NYK Line as Fugaku Maru. The 764 foot long by 123 foot beam bulker has a capacity of close to 56,000 tons deadweight. She spent eleven years in the deep sea ore trade before a sale to CSL in 1977. 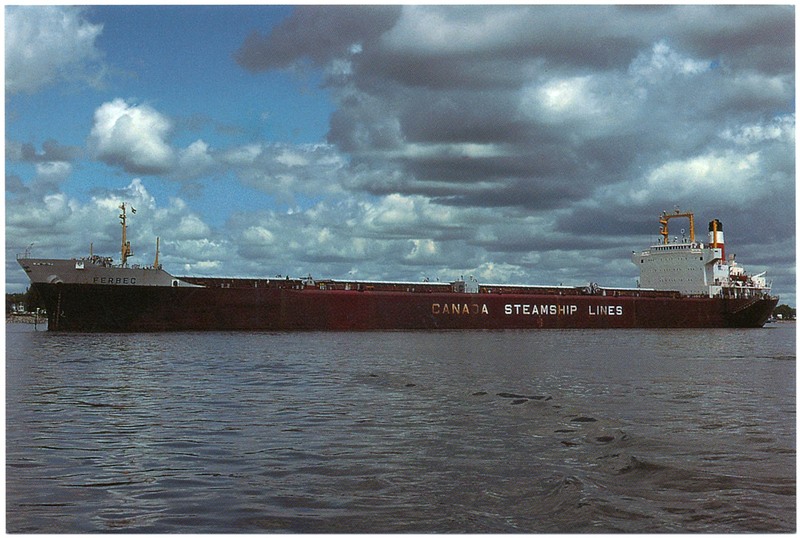 In May, on her first trip as Ferbec, she loaded 26,000 tons of Alberta coal at Vancouver for delivery to Contrecoeur, QC, and this cargo was transshipped to Stelco at Hamilton. Over the years Ferbec has been busy on the St. Lawrence but has taken time out for travels to South American and European ports. She received a $2 million refit at Montreal during the winter of 1995/96. In early 2005, the Ferbec was sold for scrap. She was renamed Michalakis with the registry of Ulan Bator, Mongolia. On February 11, she departed Montreal for her one way trip to the scrapyard in Alang, India. Arrived there on March 24. Downbound below Montreal bound for Alang, India, Feb. 11, 2005.